Upgrade your essential kitchen pots and pans with the Jamie Oliver by Tefal H902A544 5 Piece Cookware Set. The professional quality set includes a 24cm stewpot and lid, a 24cm frying pan, an 18cm & 20cm saucepans and a 24cm saute pan. The 20cm and 18cm saucepan offers long lasting, hard wearing, and professional quality alongside a durable titanium non-stick coating for true versatility. The saucepans are crafted from hard anodised aluminium with a solid aluminium core known for its excellent heat distribution properties, ensuring you get even cooking results without hot spots and the scratch resistant non-stick coating ensures even milk based sauces and scrambled eggs will not stick. The riveted stainless steel handles have a silicone insert ensuring a safe and comfortable grip. The dishwasher and oven safe saucepans are suitable for use on all hobs, including induction and each comes complete with a vented glass lid with a stainless steel handle. The Stewpot With Lid is a multi-purpose pan that can be used as a stewpot, soup pot, stock pot, casserole dish, pot roaster and is ideal for slow cooking. The versatile pot is suitable for all heat sources including induction. The pan is crafted from the highest quality and durable hard anodised aluminium with a solid aluminium core, known for its excellent heat distribution properties. A titanium interior offers superior non-stick coating and is the ideal surface for all cooking, including milk and egg-based dishes that have a tendency to stick. The non-scratch coating is suitable for use with metal utensils, except whisks and knives. 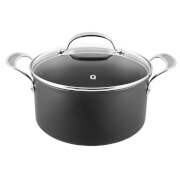 Further features include two riveted stainless steel handles with a silicone insert for a secure and comfortable grip and for lifting straight from the oven to the table and comes complete with a glass lid that has a stainless steel handle and an integrated steam vent for even temperature control. The pan is dishwasher safe and oven safe up to 210°C for up to one hour. 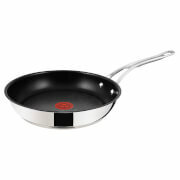 The frying pan offers the ultimate in long-lasting cookware with a professional quality performance. The cookware range features a solid aluminium core, which is known for its excellent heat distribution properties, ensuring you get even cooking results without hot spots. Tefal has created their most durable coating yet with its titanium non-stick coating that is safe to use with metal utensils (except knives and whisks). Further features include Tefal’s iconic Thermo-Spot technology that indicates when the pan has reached its optimum temperature, a riveted stainless steel handle with a silicone insert. Suitable for all hobs, including induction, the pan is dishwasher safe and oven safe up to oven safe up to 210°C for up to one hour. 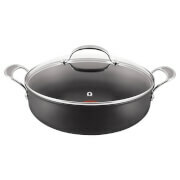 Cook up pasta sauces, risottos, soups, stocks and casseroles in the professional quality saute pan. Crafted with a solid aluminium core for even heat distribution, the pan is ideal for a wide range of cooking that requires constant stirring as the high sides will keep your hob spill free. Featuring Tefal’s Thermo-Spot technology that indicates when it is at the optimum temperature for cooking, the pan also features a stainless steel handle with silicone insert, a pouring lip for mess-free serving, and will fit the glass lid supplied with the frying pan. Suitable for all types of hob, including induction, the pan is oven and dishwasher safe.